Sean Dyche accepts you make your own luck in football. But he feels his side deserve a scratch of fortune to help turn their fortunes around away from home. Burnley were unlucky losers at Liverpool on Sunday, frustrating the Reds in the first half after taking an early lead through Ashley Barnes. Jurgen Klopp’s men scored with their first shot on target in injury time through Gini Wijnaldum, after a fortuitous break of the ball in the box, and went on to win with their second – an Emre Can shot which went through legs and beat an unsighted Tom Heaton. And Dyche said: “I don’t search for luck, you’ve got to make your own, but it’s nice every now and again if you get a sliver of it – maybe we just need that little twist of fate. “We haven’t had that moment go for us, on the road, the ball drops in the right place...they made a fantastic block from Barnesy, Lowts (Matt Lowton) late on got his foot over one, almost caught it too sweet, and it flies over. “There are a lot of good qualities to the way the side performed. 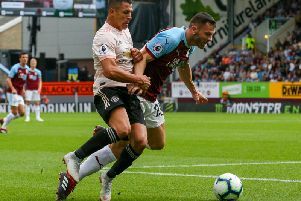 While at home, late goals have generally gone in Burnley’s favour, they have also suffered in time added on in both halves – conceding an equaliser to Hull City, losing to Arsenal twice, Swansea City, and that FA Cup upset against Lincoln City. Dyche isn’t overly concerned, however: “I don’t think you can focus on that. “You could easily say we had one at Swansea that was a clear foul, off-side against Arsenal, one early season, another referee’s decision, so you can’t just look at that stats, you have to look at the details in the stats. Burnley are seven points clear of danger with 10 games remaining, and Dyche aded: “We’re not over-thinking that, the main thing is to keep performing, I speak about it all the time because I believe in it. If we keep performing like that, things will come your way. “There’s no guarantees, but I think, over time, it comes your way.